Click here for team website. The Steiner Ranch Stars is a private, non-profit, summer league swim team made up of approximately 500+ swimmers, ages 5-17. The Stars will not be accepting new non-resident swimmers. To participate, residents must be in good standing with the HOA and agree to volunteer requirements. Space in each age group is limited. Swimmers must be 5 years or older by May 1st to participate. Returning family registration is held online from in March. New family registration takes place after returning family registration. Information is posted on the Steiner Stars website. For information click here. Stars Red and Blue are competitive swim teams for swimmers ages 5 - 17 (age as of May 1st). The teams begin practices after school in late April or early May, and the season typically runs through the end of the first week in July. Both teams are operated by the same board of directors and are designed to be as identical as possible. 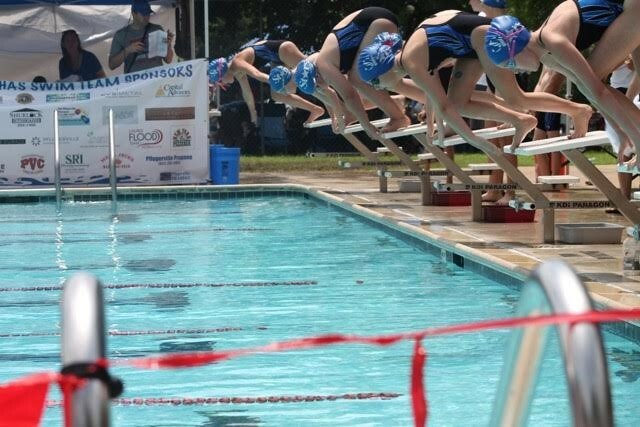 Both teams swim in meets against other swim clubs in the Austin area as members of the Northwest Swim Circuit. Detail regarding practice and meet schedules may be found visiting the Stars website.